For the last two years, it’s seemed as if someone changed my job description without telling me. I work in the same office. The faculty composition is mostly the same. But the discussion about legal and online education changed. It’s easy to find articles in the New York Times, the Washington Post, and The Huffington Post describing the apparent problems of legal education and arguing for remedies. Taken on its own, this trend may not be that notable. After all, there have been calls for reform of legal education for years. But the calls for change in legal education are part of a larger discussion about higher education now. And as everyone who spends time following educational technology blogs knows, the articles about MOOCs are everywhere. And the MOOC phenomenon seems to have changed the course of public discussion about higher education’s future. So how has this discussion changed my job? Simply put, I’m spending a lot more time talking with faculty than ever before. We’ve always been contacted frequently because our instructional technology staff has had a good reputation for providing timely support. But faculty want to talk about blended learning now. They want to talk about flipped classrooms. They want to get together and talk about MOOCs and online learning. As a result I spend much more of my time meeting with faculty individually, corresponding with them at length, and holding workshops and lunches to discuss these topics. I do not see these discussions ending anytime soon. No single initiative or project will address this need adequately. Our faculty see innovative teaching as a theme that is here to stay. Consequently, it’s not hard to envision a time when my primary role as manager of support services will be equalled or maybe eclipsed by a comparable demand for instructional design and faculty development to support more innovation in our J.D. curriculum and our broader educational offerings. What kind of experimentation was taking place with online learning in law schools? Who is driving that experimentation? 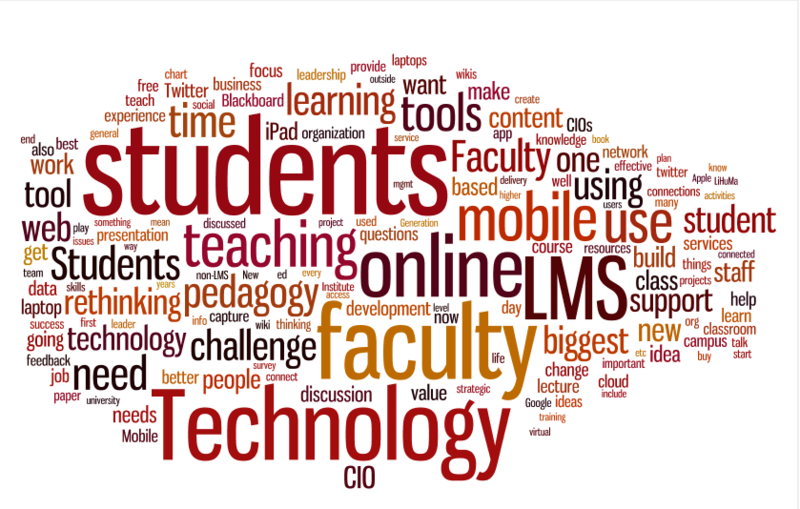 What do faculty considering an online course need to know? How can they be prepared to think through the difficult issues involved? What must an institution consider as it begins to develop online courses? What about intellectual property and copyright for courses? How to keep abreast of the changes in accreditation and regulation of distance learning in legal education? Developing model policies and information for law schools engaged in distance learning programs. Developing best practices and standards for distance learning programs. Providing comments and policy recommendations for accreditation bodies that regulate distance learning in legal education. I’ve been lucky enough to attend a few meetings of the Working Group in the last year. I’ve become acquainted with some friendly and helpful people who are eager to share their experiences developing and teaching courses. I’ve become much more aware of the issues for faculty, support staff, and institutions. And I now feel comfortable talking about the changing landscape of accreditation and regulation of distance learning in legal education. Most importantly, I am pretty confident that if I had a question about online learning in legal education, I know I could get an answer from the most experienced people on the planet. I’m eager to hear from those of you who perceive similar changes in your work. What’s changed? How are you coping? What gets you excited about this period of rapid and unpredictable development in higher education? NB: I do not have a JD and other than sitting in on a few 1L courses, I have not taken part in much of the law school classroom environment. What I do know is mostly from talking with students and from direct conversations with faculty. I am fully aware that curriculum is not “hypothetical” and that actual cases are reviewed, and that skills are taught. There is nothing “wrong” with today’s curriculum. The difference between today’s curriculum design and one that is more skills-based is subtle yet important. The value of understanding the subtle issues underlying and coming from a specific case is not at debate. The usefulness of understanding how to build a case from scratch, how to file motions, and other practical, day-to-day activities is the basis of this post. More and more, law firms are looking not just for graduating law students with the intelligence to make for good associates, but also ones that have the needed practical skills to start “producing” from day one. This means familiarity with e-discovery systems, being able to dive deep in research while still being part of a team, and an understanding of concepts beyond just law – about how to be good professionals, with solid interpersonal skills and the self-awareness to succeed. Accordingly, law schools either already have or should seriously consider a curriculum shift towards the development of these skills. Obviously, the traditional foundation courses in Civil Procedure and Torts will never go away (though changes in the environment in which they are taught are another matter, and one addressed later in this post). But clinics need to become part of the formal curriculum, rather than electives, and courses that show students how to put an actual case together, from cradle to grave, need to become a bigger part of a student’s educational experience. This curriculum shift has no bearing on the importance of the traditional foundation courses nor does it give a long-term advantage to one student over another in the job market. A student with experience on e-discovery tools will be very good at e-discovery, but will still need to work just as hard to master all of the other skills in order to succeed overall. This might improve that student’s job prospects initially, but over even the short-to-mid-term an exceptional student will still rise to the top. But perhaps an exceptional student that also has a solid grasp of operational skills will be that much more attractive to employers. From an Ed Tech perspective, there is a bit of a chicken-egg issue, though one that also involves bold moves by deans and faculty. Until a skills-based education is adopted as the foundation of pedagogical design, clinical work, cradle-to-grave building of cases and experience with the tools one will see at a firm will not gain prominence. Until those types of programs and courses receive the full weight of the school’s support, a skills-based curriculum will not emerge. And should that shift occur, it cannot be a slow transition – it must spring forth fully-formed, as did Athena if from Zeus’ brain, to provide an immediate and full impact on students. But when this shift occurs – and in my opinion it will, or the school will become less and less relevant – Ed Tech folks need to be prepared. Discussions about installing incredibly expensive e-discovery systems must be had, and consultations with faculty about different case-preparation tools will be critical. Going paperless (or at least paper-light) comes into play on a massive scale. Clinics will need tools that will make their processes more and more efficient, so that students spend less time worrying about where to put or how to access files and more time on filling out documents and going to proceedings and arguments. This is a trend that, to me, is not only already happening at some schools but should be seriously considered at all. For Ed Tech departments, we should be at least advocating for the analysis of business processes that supports the implementation of a skills-based education. We should look at how clinics get their work done, how we can make those processes better, and put those solutions into play. This will position ourselves most effectively for changes. When I first came to SCU Law about 3.5 years ago, I would have claimed that collaboration and team-based learning was utterly and perhaps forever contrary to the instruction of law. Today, while I certainly see many classes including team-based work in the curriculum and some faculty quite aggressively challenging traditional methods of instruction, I think it’s still valid to say that a truly collaborative atmosphere is not how one would characterize the law school classroom experience. On one hand, you have students that are forced into quite fierce competition at the individual level due to the requirements of curved grading. There is also cold-calling of students in large, amphitheater-style classrooms for at least the first year of courses, and libraries where the study carrel still dominates over the group study room. On the other, courses such as our International Business Negotiations require students to work as teams, assuming specific roles within a fictional company’s legal team, and work out deals with corresponding teams across the globe in Korea. The issue is the space “in between” these examples. Even those courses that do have teams often form them out of procedural need rather than pedagogical design. A more traditional Negotiations course uses groups not because they want to create an atmosphere of collaboration and teamwork, but because there must be two sides to a negotiation. These are of course very broad characterizations. I am confident that many professors emphasis team-building when opposing sides are formed in a negotiation. Even more are certainly considering changes to curriculum. But, at least presently, there are very, very few courses designed around collaboration. Curriculum is not built around the need to learn team skills – cooperating, equitable contribution and sharing of information, and nested collaboration by different subsets of the same team. This level of collaboration is self-reinforcing, and produces teams that are far more than the sum of their parts. There is essentially one reason why I was so excited to attend EDUCAUSE’s Midwest Regional Conference in March: the Keynote Speaker, Dr. Michael Wesch. With the beauty of YouTube and TED talks, I can share the keynote presentation with you, albeit in a shorter form. Wesch focuses on the effects of social media and digital technology on society. Being an educator, he often concentrates on how this is changing the worldview of college students. I think law schools are behind in catering to new ways of teaching and learning. Law School is traditional. The modern world of education is becoming less so. There are several trends from the conference. I chose a top 5. 1) Twitter. Twitter isn’t just for celebrities. This is the 3rd conference where I’ve tweeted the conference. Below is a Wordle of the conference tweets. (#MWRC11). There was an intense amount of conversation on the Twitter back channel. Through this back channel, many of us discussed the utility of using Twitter in class as a way for students to discuss (class related) things during class. Many undergraduate professors use this tactic already. Would this tactic work in highly Socratic classrooms? 2) Pedagogy. Being an educator of educators, I sometimes have difficulty not telling faculty how they should teach. My job is about arming faculty with tools to educate themselves and their students. To meet the needs of the modern students, many faculty will need to rethink their teaching methods. This will be a challenge. 3) Technology. Along this line, students (even law students) are armed with tools to educate themselves. Faculty complain of students using laptops too much in the classroom. Despite studies suggesting the useful nature of laptops in learning, laptops have been banned. I’ve discovered is that debunking the myths of technology use in the classroom is not enough to get faculty or students willing to try something new. I’ve found that finding a solution to a problem and in turn, supporting that solution works better. The mere use of technology is not the solution to problems in teaching and learning. 4) Students want the opportunity to learn with new tools – as long as those tools have a purpose in their learning. Technology shouldn’t hinder a learner’s learning or a teacher’s teaching. The challenge is to not overwhelm the students with tools – where students spend more time learning the tools than learning the subject. Students want faculty to use course management systems effectively- but using the CMS isn’t enough. 5) Mobile Use. Other than the words “Social Media” I think I heard the words “mobile” the most. Mobile learning is on the rise. Most Course Management systems have come out with Mobile Apps if not Mobile sites. Law schools with a large commuter population might do well to get in to mobile learning early to help with access. So where do these trends and questions leave law schools? Do we embrace the change and force our faculty and students into a new mold – or do we hide from the change and teach the law the way it has been taught for decades?